Spending time outdoors is a wonderful way to bond with family and friends, and enjoy nature. Before you head out into the great outdoors, you need to be aware of a danger lurking not so deep in the woods—Lyme disease. This bacterial infection is contracted after coming in contact with a deer tick that has feasted off another infected animal. Early Localized Lyme Disease: A rash develops on the skin at the site of the bite within one to 31 days. It resembles a bull’s-eye and slowly expands followed by flu-like symptoms. Early Disseminated Lyme Disease: Skin, joint, nervous system and heart complications occur. Late Persistent Lyme Disease: Infected person develops severe joint, nervous system and heart complications. As you can see, prevention and early recognition of Lyme disease is critical for your well-being. 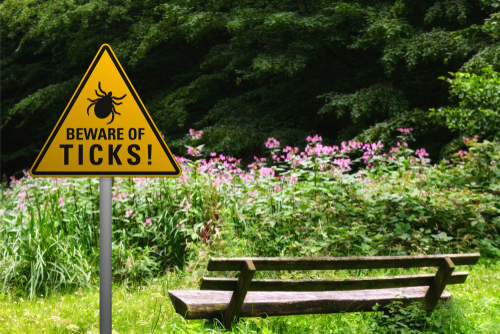 Wear light-colored clothing to make identifying ticks easier. Spray yourself with insect repellent that contains DEET. Walk in the center of trails to avoid overhanging trees or bushes. Keep long hair tied back so that ticks cannot climb up your hair and attach themselves to your scalp. Wash your body and clothing and inspect your body for ticks. Inspect your dog’s coat too if he or she has been playing in wooded areas. Use a tweezers to grab the tick firmly where it has entered the skin. Slowly, yet firmly, pull the tick directly outward. Once the tick is removed, clean the bite thoroughly with a disinfectant and watch the area for any symptoms.